Many visitors will arrive in Schull around lunch-time. You park the car in the car-park above the fishing boats and wonder where will you get lunch. Just look up towards the street and there you’ll see Café Cois Cuan, serving breakfast, lunch, teas and coffee. It wasn't there last year, you might say. And you'd be right. The bright and tidy café, run by Kevin Rochford (chef) and Brittany Ingram, opened at the start of 2015 and, during a lunch-time visit last week, Brittany told me that each week so far has been better than the previous one. And we hope that trend continues. For here you will find good food at a fair price. And, by the way, you'll find excellent coffee. 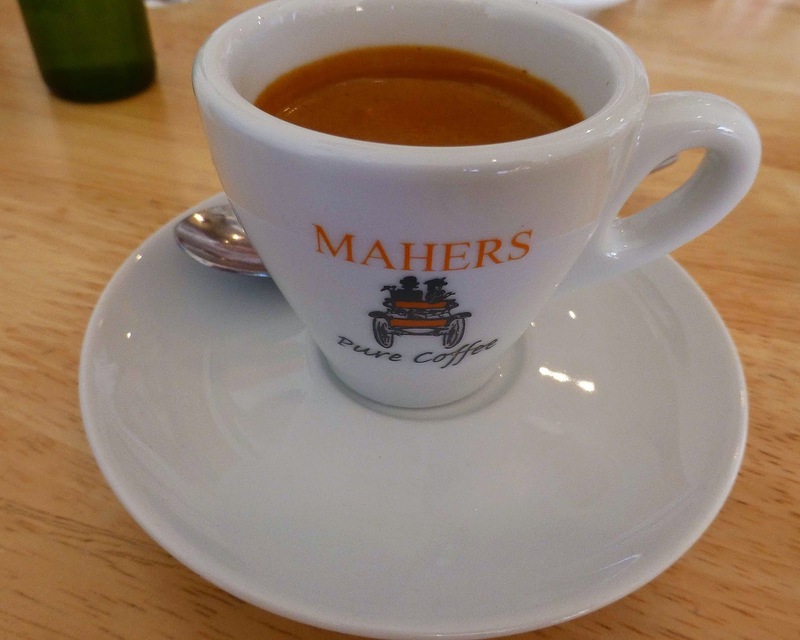 They prefer the “classic” and so they went for a Maher’s blend and the cup I enjoyed was one of the very best I’ve had in a long while. There is quite an extensive menu at this family run place and be sure to check the board for their daily specials. Indeed, we went for two of the specials. 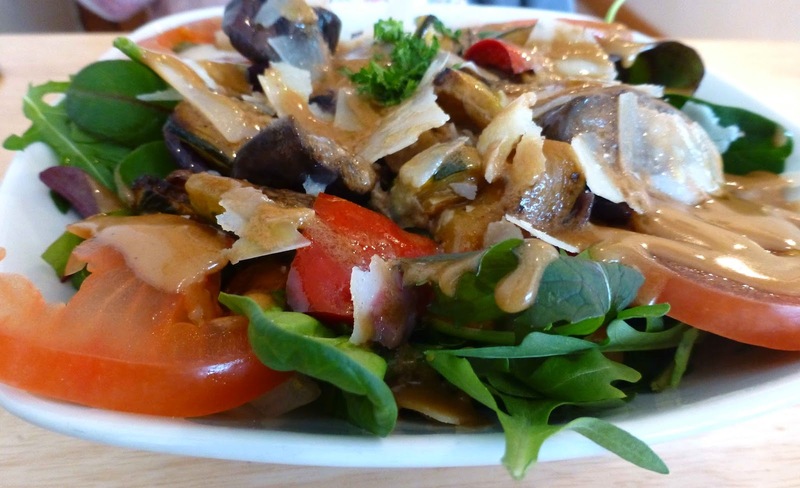 CL picked the Roast Mediterranean Vegetable salad, a very impressive plateful indeed in which the aubergine played the starring role. It was available in two sizes, one for €6.95, the larger for €9.95. 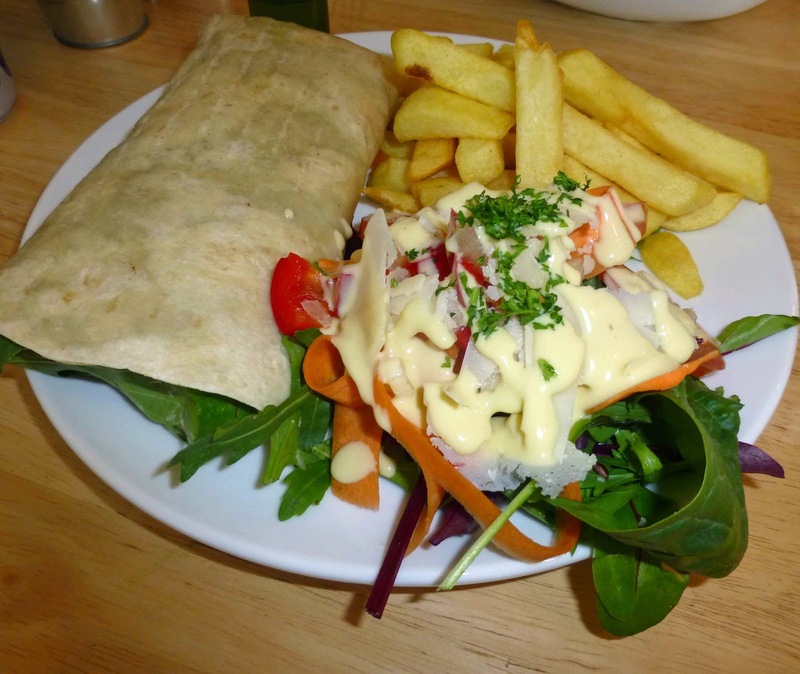 I had been thinking of going for the De Roiste Black Pudding and Cashel Blue Cheese salad but instead picked the Tune special, basically a Tuna Wrap Special with salad and chips. Quite a meal, I must say, and the salad, just like CL’s, was superb. There were lots of sandwiches available as well, including a Ploughman’s Lunch for just €5.95. You could also start with a bowl of soup and if you were feeling the chill, they were offering a Beef and Murphy’s Stew! And if you enjoy something sweet, well they have you covered as well. They have Baked Apple cake, Chocolate Fudge cake and Maple Banana Slice (in nibble and full size!). No alcohol here but they have lots of soft drinks and teas and that superb coffee. Service is efficient and friendly and yes the view from the window seats is excellent.